Rounded corners are all the rage - and they have been for quite some time in web design. The way they "soften" up a design make them quite attractive to designers and decision-makers. Unfortunately, implementing rounded corners in a web page is not nearly as easy as it is to implement in a mockup using an image application. When talking about rounded corners, there are 2 distinct user cases to be considered - the first is when creating rounded corners only on the top corners of an area - this is commonly seen on tabs and block headers. The alternative use case is when all four corners of an area are rounded - this is usually seen in blocks and around content areas. This article will focus on the the case where all four corners need to be rounded. The result will be a method of adding the ability to optionally apply a rounded border to any block on your site in a way that doesn't break when the block is resized. By the end of the article, you should be able to add this option to just about any Drupal theme - the relevant files you'll need are available for download at the end of this article. Keeping a site's design as clean as possible is something all (well, okay, maybe not "all") designers and developers strive for. One relatively easy thing that you can do towards this goal is removing the supporting (and often unnecessary) text around your site's search field. I'm talking about the "Enter search terms" or "Search this site" text that floats innocently above or next to the text input box. Is this really necessary? I don't think so. A much cleaner way of presenting a search box is with some default text inside the input field that automatically disappears when the user moves the cursor into the field. The Flag module is one of those modules that in its previous incarnation (as the Views Bookmarks module) was a bit inflexible and often (at least in my cases) required some manual tweaking of the code to get it to do exactly what I wanted (no offense to the original authors, I actually used it a surprising number of times). The updated and renamed module is a breath of fresh air - it is an ease to install and configure for any number of use cases - in this article, I'll demonstrate how you can set up a list of the best comments on your site. The Flag module is extremely useful mainly due to its excellent integration with other Drupal modules - specifically Views and Actions (part of Drupal 6 core). It's also chock-full of AJAX-y goodness (flagging items doesn't require a full page refresh) and a plethora of configuration options. Displaying hierarchical content is a common request of database-driven web sites. Drupal gives you great flexibility in doing this without writing a single line of code, using a couple of battle-tested modules. As an example, let's say you're building an automotive web site. Your site is going to have a list of automotive brands and the vehicles they build. You'd like to only have to enter each brand's information into the database once, then simply refer to that brand whenever you add one of their vehicles to the site. In this example, I have 2 brands, Chevy and Jeep, and each brand has 3 vehicles. 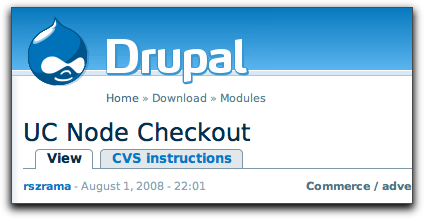 Drupal's powerful CCK module allows you to define different content types for your web site. The Node Reference module, included with the rest of CCK, allows you to set up hierarchical relationships between content types. The "summary" list is Views is a really handy feature, but unless it is properly configured, it can lead to an inconsistent experience for end-users. The goal of this post is to demonstrate how a little bit of configuration can provide a very consistent user experience. As you can see, it is a very simple content type, with only a single added field, "field_food_type". This text field is set up to require the user to select one of its options. This works great and is easy to set up if this is what you're looking for. However, I find that often I'd like the summary and a listing of matching content to be displayed at all times. When there is no argument present, then I want a paged list of all the content as well as the summary. 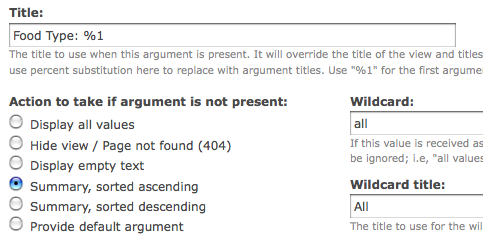 When an argument is present, I want the filtered content but I still also want the summary. This can be quite easily done using a display attachment. Help! Anonymous User Comments Disappeared! Read more about Help! Anonymous User Comments Disappeared! Looks like some MySQL data export/import operations can fail for anonymous users. I just did a data dump from my local development server to the live site and all the comments by users who aren't logged in were not showing up. Gone. Missing. It turns out MySQL was trying to stick the autoincrement value in the `uid` field in the place of the supplied `0`. One of the most frustrating things about Drupal's current architecture is that comments, and the form to post them, are attached to nodes and don't easily allow you to move them around in your TPL files. There really should be an easier way to just place them anywhere you'd like. Most times this doesn't get in your way, until you want to do some fancy layouts where your content is split into multiple columns on the page. If you're like me, most of your projects are redesigns of existing sites. And if the site is already on some kind of CMS, this means importing content from the old system into Drupal, and to make it easy you'll do it with MySQL directly. There are pros and cons about this approach, which I am learning, and one of the cons is that content created by the database may not always get plugged into all of Drupal's various tables. Sure, you got the text into node, node_revisions, can your CCK tables, but there is more than meets the eye. Today's challenge: your editors just handed you almost 200 taxonomy terms to add to the site, and you don't have the time or inclination to hit the taxonomy/n/add/term page for the next 2 hours or so... AWK to the rescue! What you'll ultimately generate here is a file that stores everything you need to know about importing these terms via a CSV - the term names, the weights, good IDs, and the TID of the parents. The new terms, with an "x" where the new TIDs will be placed, and the VID, Description and Weight all filled out. In my previous post, I talked about how I implemented the dynamic marker system on OffRoadAtlas.com. In this post, I'll cover the functionality that the PdMarker adds to the site. I recently upgraded OffRoadAtlas.com with a custom map interface based on the GMap module. I was able to do this while leaving the GMap module is virtually un-hacked (with the exception of modifying the "GMAP_API_VERSION" variable) - all of the customizations were made via an additional "helper" module that was written specifically for this site. Where images/whatever.jpg could be a css file, or other file, but is normally an image. When it's not. Luckily Drupal has tools to help you in this case. potentially use an argument to do it. When installing a new Drupal site (or when your list of available updates gets nice and long), you'll often have to download tons of modules, unpack them, and copy all of the resulting directories to your sites/all/modules directory. Personally, I'm not a fan of all the clicking, downloading, unzipping and most of all waiting! Today I finally settled on a workflow that gets the job done, and it's called the UNIX command line. If your server doesn't use some flavor of UNIX or Linux, or if your web host doesn't allow you shell access, you may want to stop reading after the next paragraph.